Fuel evaporation control systems (EVAP) first appeared on automobiles and light trucks in 1970. Many vehicles were mandated to be fitted for EVAP systems. This procedure was typically carried out by a qualified auto repair shop. The EVAP system is used to prevent the release of gasoline vapors, from the fuel tank, into the atmosphere. Gasoline vapors are a major source of hydrocarbon emissions. The EVAP system consists of a EVAP canister, purge control valve, canister purge hoses, fuel tank vent lines and a sealed fuel tank cap. The EVAP canister is filled with activated charcoal for the storage of gasoline vapors. Fuel vapors are supplied to the canister through the fuel tank vent hose and stored there until they can be burned in the engine. The purge valve supplies vacuum to the EVAP canister to draw the fuel vapors into the engine, where they are burned in the combustion chamber. Fresh air is drawn into the canister through internal vents or from a controlled canister vent valve and mixed with the fuel vapors for easier burning. Diagnosing and troubleshooting EVAP systems can be tedious and in some cases impossible when the systems are closed, hence essentially forcing an auto repair shop to replace the entire system. Fuel vapors from the EVAP canister can only be drawn into the engine under certain conditions. 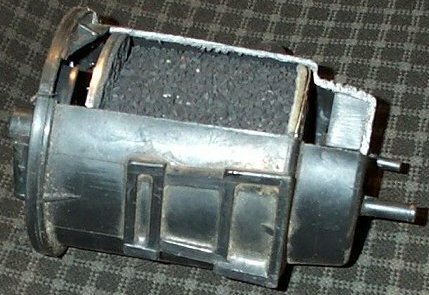 If canister purge occurs, under the wrong conditions, engine performance and emissions can be adversely affected. The canister purge valve on most engines, is electronically activated by the engine control module to provide purge only under specific parameters. Canister purge is normally only commanded on when the vehicle is moving, the engine coolant temperature is at a specified level and the throttle is open. Before the arrival of computerized emission controls, canister purge was controlled using a thermal vacuum switch and a ported vacuum. The thermal vacuum switch is designed to only supply vacuum when a specified temperature is reached. Ported vacuum is a vacuum source that is only available when the throttle is opened. Vehicle speed was not a consideration in enabling canister purge. The fuel EVAP system was purged anytime the throttle was opened and when the engine was warm. The fuel tank is sealed using a special fuel tank cap. The fuel tank cap is designed to provide an airtight seal, unless high levels of pressure or vacuum are present in the fuel tank. If this occurs, fuel vapors are released into the atmosphere through a pressure relief valve contained in the fuel tank cap. Is the charciol canister needs to be replace once in a while? Or is the replacement part of a maintenance routine?